First of all, welcome to the sinespace family! Here you will find all of the basics, like moving, how to chat and more. It's easily broken down into parts, so you can jump right into the topic you want! 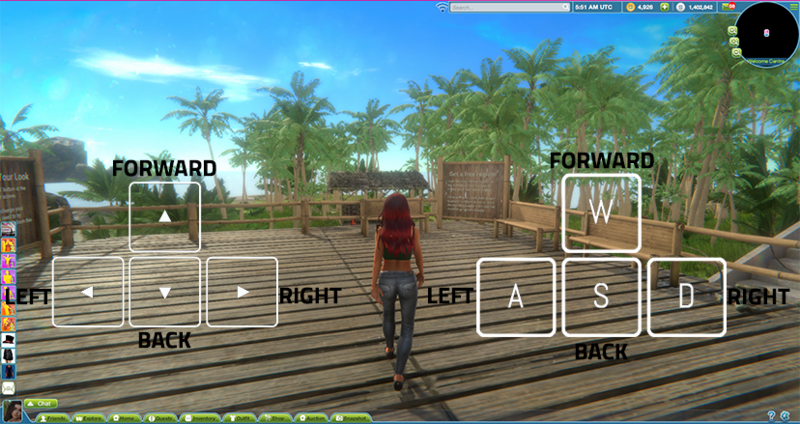 To walk around, you can use the WASD keys, arrow keys, or we have a Click to Walk setting. The click to walk allows you to click on the ground and your avatar will move to the spot you clicked. If Click to Walk isn't your style, you can turn this off under the settings at the bottom of the client screen. You can also fly around the world. To fly, hit F on your keyboard. You can turn direction using WASD or arrow keys, and fly up or down using Page Up/Down or E to go up and C to go down. You can also own vehicles in sinespace to help you get around. You can purchase cars or planes from the Shop and then spawn them into the region from your inventory. Just click on the car/plane in your inventory, then click on the 'Drive' button. Click on the car/plane in the region to get in and take it for a spin! Cars and planes work the same as walking. 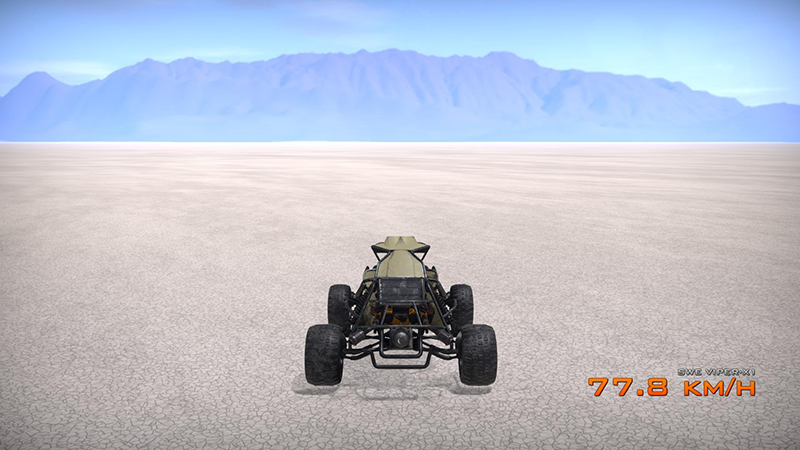 You can use WASD and arrow keys to turn and accelerate, and use space bar to brake. To get out of the car or plane, click on it. For more information on how to change your avatar gender, please see our Changing Gender page. This will explain how to change your avatar gender, and also how to change gender in your profile. Speaking of profiles, you might want to change what your profile says in sinespace. To do this, click on the three dash simple at the top of the client screen. This will open up a menu. Click on 'Edit Profile'. 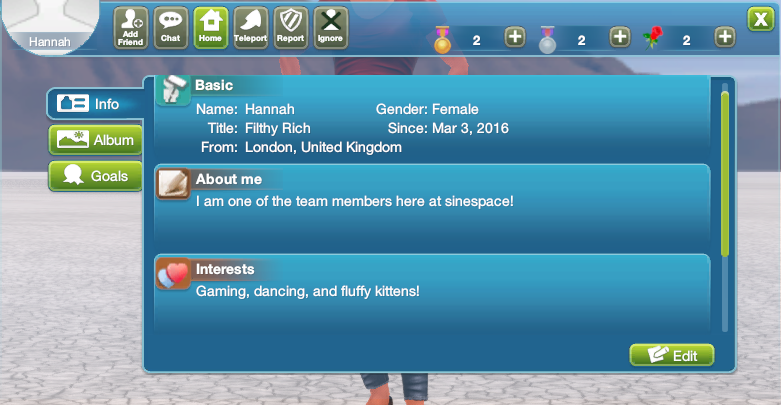 You will get a nice close up view of your avatar, and also see a little box containing your name, gender, title, where you are from and also how long you have been a member of sinespace for. There will be a button saying 'More'. Click on this, and this will bring up an expanded version of your profile. Click on the edit button, and add in all the details you want. Hit the Save button and voila! Your profile has been changed. You can change it as little or as often as you like. You can also set a profile pic. Click on the round empty image box in the left hand corner of your profile. This will open our snapshot tool. You can use this to take a selfie, and then hit 'Make Profile Pic' after you have taken the perfect shot. All of the snapshots you take in sinespace will be saved to your in world album. We have an inbuilt snapshot tool (as mentioned above) that allows you take shots in world. Our snapshot tool has different features, such as adding a filter, changing the pose of your avatar, changing the camera angle and distance, and also adding an overlay. To open the snapshot tool, just click on on the Snapshot button at the bottom of the client screen. This is where you can change all of the settings for the snapshot. You can see that you can also set it to record a 3 second gif, or you can capture as a 360 degree image; Cool right? Here is an example of what you can do. So sassy! When you have taken the shot, you can choose to rename the image, add a description or retake the photo. But, best of all, you can choose to email it to your friends. Sinespace is the place to socialize, so we have a few ways you can do just that. You can chat with other people all over sinespace by chatting in the general chat window. You can also chat with just the people in your region by clicking on the region chat button in the chat window. If you want to IM a person, you will have to click on them, and then click on the Message button in their profile. To email a person, click on them, and choose the email option in their profile. You have to friends with a person first to email or IM. You can also use XMPP clients with sinespace which will sync with the in world chat. See our XMPP Chat Client page for more information.